Stunning lake views, lovely gardens, fresh air and privacy! Sleeps Up To 8 in 3 Bedrooms, Deck, Dock, Fire Pit, Grill. Ryan's Way Cottage offers guests 2 sleeping areas. First, there are two nicely appointed bedrooms in the cottage one with a queen and one with a full bed. The finished room above the detached garage offers 4 single beds dormitory style with a futon, closet space, TV and bathroom. It has A/C. This would be a great gathering place for younger guests. The cottage sits on a large lot. There is plenty of space for your group to gather around the two available fire pits, one on the lakeside,the other more protected from the wind in the backyard. There is a large enough yard to set up group games on the lawn. The waterfront has a dock, a sandy , hard bottom, great for swimming. A charcoal grill and outdoor furnishings will offer guests more amenities. Families can also rent boats of your choice nearby or bring their own as there is a buoy out in front of the cottage. Full kitchen. well equipped. There is no garbage disposal. Great little cottage with a super deck for coffee in the morning, lunch and dinner while watching the lake! Everything you need for a terrific vacation! Fantastic setting! Perfect for my wife and me as well as four children and a set of grandparents! Nicely appointed and comfortable. Lots to do on rainy days. Close to Leland and Leelanau villages. Very quiet and secluded however. Gorgeous views of the lake! Thank you! Hope we will see you again! 1. Add a few standing fans in the house for those rare hot and humid days or a window unit like in the bunkhouse. 3. The trees on the property are in great need of some trimming and grooming. You can't see the address sign because it is hidden by tree limbs. If possible, grass should be cut on Saturday prior to new guests arriving. 4. Take the wheels off of the beds in the bunkhouse. The kids said that if they rolled over that the bed would move a couple feet. We would definitely recommend anyone give this location a chance. When we come back in a couple years, we will absolutely consider staying here again. 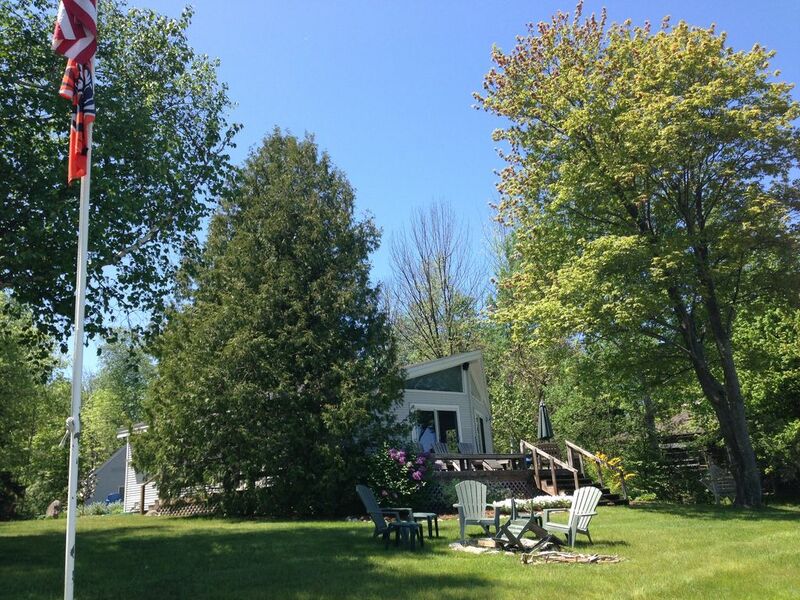 Great location - close to Lake Leelanau and Leland. Open kitchen and dining area. Beautiful view of the lake. Relaxing place to read a book and sit by a fire. My family's most special place in the world. We stay here every year! So happy you enjoy your time at this great vacation home! Look forward to seeing you in 2017!! We enjoyed our stay tremendously. Mary Lou was prompt in responding to our questions/concerns, such as providing a fan for the sleeping area above the garage because it was very hot and there was no air conditioner. So happy you enjoyed the lake breezes during this very warm week. Happythe fans did the job in the upper room! We have an air-conditioner now! Had a great time! Only issue I can think of was that there really isn't safe swimming off the dock since the bottom becomes extremely silty and you sink into the muck. Really have to swim out to the sandbar which isn't too far, but may be an issue for some. No air conditioning might be an issue for some, but keeping Windows and doors open throughout stay kept things just great. The bunkhouse was a little tougher to keep cool. It really could use an AC unit. Thank you for your review, The dock is 110 feet long and swimming off the end of the dock puts the swimmer in deeper water. Children should stay within 100 feet of shore and not go off the end of the dock. Swimming off the side of the dock, the sand is hard and good at least up to 70 feet from the shore, very nice for swimming especially for children! This area is is an ideal spot for a family vacation, for a couples get away, for multi generational vacationing. A few years ago, the area of Sleeping Bear Sand Dunes and the National Lakeshore was voted "The Most Beautiful Place in America" by Good Morning America. We are a foodie destination, great wine country as well as known world wide as the Cherry Capital of the World.. Of course, a must see are the sand dunes near Empire, Fishtown in Leland, and the Lighthouse in Northport. Refund Policy: We return deposits in full until February 1; thereafter we refund deposits in full l if and when we are able to rent your reserved week. Final payments are due 2 weeks before arriving on the property. After that time, no refund will be made.